This year was the worst of all , it was cold all the time , rainy , windy , the sand on the beach was wash out, the golf courses were very wet . But the condo kepted us warm . If I may ask a question?? I have always wonder why there is only one exit in the condo? ?...I find that it is not very secure in case of emergency?? At least a lather in the back? I had no problem working with staff. The maintenance men came in did their job and left. Love the locations & amenities. This condo is clean, well appointed and OCEANFRONT. Sitting on the deck is like being on the beach. The reason I gave this condo four stars instead of five is strictly because of VRBO. They work with a realty company to rent this property instead of the owner. That said, I overpaid for this condo by $400! Needless to say, its doubtful that I will ever use VRBO again. I will however stay in this unit again. Next time I will book directly with Grand Stand Vacation and Rentals 800-334-5015 and save VRBOs upcharge. Ive used VRBO several times in the past and always had a good experience working directly with owners. This, I felt, was decieptful. Love Heron Pointe....Love the area how it is quiet..tucked away from all the big hotels...but just as easy to drive to everywhere you want to go. We Stayed in building letter E... perfect.. right next to the indoor pool!! Your people are great. Just the call for service maintenance twice no one showed up. Minor issues but same as year before gets annoying. The gas bbq did not work again this is the third time. You need to get someone who knows about these things and fix it. The bbq unit is very good just needs to be able to run at high temp. Also need to enclose the unit from beach wind shuts it down. The dryer needs to vent out properly just like last year old machine but worked. Needed proper clear uninstructed venting. Towel bar feel last year this year again. Patio door change the wheels or replace it. No use having patio you cant use or door not shutting and wasting airconditining. Might look at different unit next year or might look elsewhere. The lady in the office was super nice and helpful. We liked the location. It was close to everything. I feel like the sidewalks need some attention. They are broken and cracked, plus pot holes. My daughter rolled her ankle. The carpet upstairs on the landing was bad. The security guard was creepy. The big cockroach bugs are nasty. 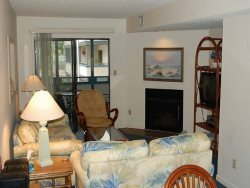 Pictures did not do justice I've stayed in many vacation rentals over the years and it seems most of the time that they are never what the pictures made them out to be. This stay was the exception to the rule. Everything in the rental was as pictured, usually better, and I had no problems with things being broken or just junk thrown in them due to the fact it was a rental. While there we were visited by an appliance repairman who fixed two items that we were not even was aware were broke, worth the 30 min interruption. This proactive approach to rental management will ensure that the next time I look for a vacation rental this will be my first choice. The reason I don't reserve a year out for the discount is that fact that I don't have a flexible schedule to commit this far out. Outstanding unit, best I've experienced in the last 10+ years of visiting.